Having read and enjoyed the Master of War series, I had high hopes for The Last Horseman: I was, most definitely, not disappointed. Not since James A Michener have I read such an authentic historical novel and the research time invested by Mr Gilman shines through. Even the writing style itself is better than Mr G’‘s previous work, retaining merely a trace of the romantic naivety of his earlier books. The comparison to James Mitchener continues in that James A’s work describes every event in the sequential story in detail. 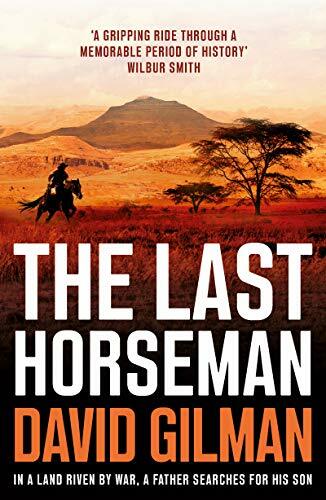 So, for example, the journey from Ireland to Africa, not described at all here, would have been drawn out in a Mitchener novel: I think that I prefer the crisp pace of David Gilman’s style. Although this book is about the Boer War, set in Africa, the first third, set in Dublin, is so compelling that I was, actually, disappointed when the story shifted continent. Then the second two-thirds of the novel sets out the scene with such clarity and evocation that the reader could almost get sunstroke from just reading this. My only other grumble is, really, a compliment: Pierce and Edward make it out of Africa, travelling hundreds of miles across hostile territory and then finding a Portuguese ship for the journey home and how do we know this? Because few terse lines tell us so. I would have loved a few more chapters describing the adventures on that journey but then I suppose that a good author always leaves the reader wanting more. Oh yes, and some of the technical research lacked a bit of real word practicality: a Mauser rifle can, indeed, kill at 2,000 yards, but not deliberately: only in the same way that a .22 fairground rifle can kill at a distance of half a mile, if a random shot happens to hit an unlucky person 850 yards away. I was surprised by the events at the climax of the chase (I’m trying to avoid spoilers here) but the book is better for it. At the end of the book, all of the loose ends seem to have been tied off and there are no periferal characters waiting to be developed, so there seems to be little chance of a sequel. And that’s a shame because David Gilman has really hit his stride here and I crave more. Cracking stuff Mr G, please can I have some more sir?